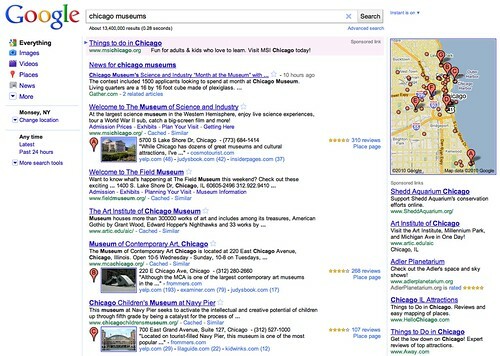 Yesterday, Google officially announced Place Search. We have seen signs of this coming with some tests in the past. In short, if your search contains anything that might signal local intent, Google may show a map above the AdWords ads on the right, and then automatically include some local results within the organic results. Plus, they added a "Places" link on the left hand navigation bar in Google's search results. Greg Sterling has a nice review at Search Engine Land. Greg said "the changes reflect Google’s commitment to local." It does and many local optimizers are really happy with this and can't wait to start messing around and seeing how they can get their local results top. But AdWords advertisers are not too happy. The map in the top right position moves down their ads that would have shown up otherwise. They are not happy. Plus, they feel it is merging the organic results with the paid results by having an organic map above on the right, of the ads. Forum discussion at Google Places Help, DigitalPoint Forums, WebmasterWorld, HighRankings Forum, Search Engine Watch Forums and Google Web Search Help.